Joan of Arc (1412-1431) is a French heroine and Roman Catholic saint. Born in obscurity to a peasant family, she travelled to the uncrowned Dauphin of France, advising him to reclaim his French throne and defeat the English. Joan of Arc was sent alongside French troops to the siege of Orleans and rose to prominence after the siege was lifted after nine days. She was later captured and burned at the stake for heresy. However, as she predicted, seven years after her death, France was reunited with the English defeated and Charles crowned King. Joan of Arc was born in 1412 Domremy, France. Legend says that she was born to an auspicious sign – held to be a forecast of national triumph. However, what is more certain is that her family were poor and her region had suffered from the long conflict between England and France. From the age of twelve, she began to have mystical visions. In these visions, she said she felt the voice of God commanding her to renew the French nation. At her later trial, Joan of Arc said she felt these visions were as real seeing another person. The visions were often accompanied by light and the presence of saints such as St Michael and St Catherine. These visions made Joan of Arc even more religiously inclined. She would frequently go to confession and, it is said that whenever she heard the bells for Mass she would immediately drop her work and run to church. Initially, Joan did not tell others about her visions and inner commandments but in May 1428 the divine messages urged her to seek an audience with Charles de Ponthieu currently an ineffective and relatively weak leader of the French. Under Charles de Ponthieu, the French were without direction and without a real leader. When Joan of Arc came to the court she made a strong impression on Charles with her passion and conviction. It is quite remarkable that this 17-year-old peasant girl was, as a consequence, given control over an army and allowed to lead them into battle. 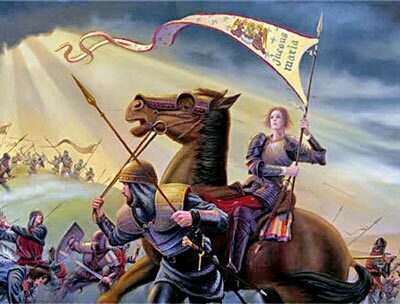 Within a year Joan of Arc had led the French army to victories at Orleans, Patay and Troyes. Many other towns were also liberated from English control and it allowed a triumphal entry into Dauphin for the coronation of King Charles VII on 17 July 1429. 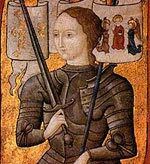 For her exploits and leadership, Joan of Arc and her family were granted noble status. She has also won the hearts of the French soldiers who looked up to Joan as an almost mythical leader. However a year later Joan was captured by the Burgundian forces at Compiegne and sold to the English. Her trial is well documented and provides a revealing insight into her character and destiny. The English and members of the French clergy decided to put her on trial for witchcraft. In many ways, it was a show trial with the result cleverly orchestrated. 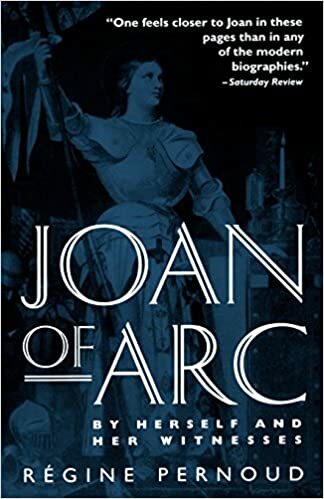 The leading church investigator was Pierre Cauchon – a staunch supporter of the British who hated Joan of Arc for her revival of French national pride. However, another interpretation is that Cauchon genuinely felt obliged to save Joan’s Immortal soul from damnation for the claims she was making. 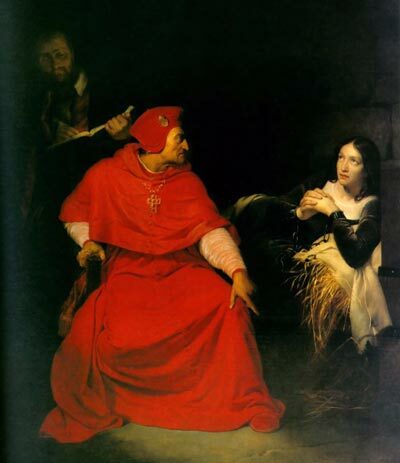 The conversation between Joan and Cauchon is revealing for Joan’s strength of character; she even offered a warning to the Bishop about passing false judgement. The trial was a very testing experience for Joan. Initially, the trial was held in public, but her responses were much sharper than her prosecutors expected. Her answers stood a challenge to the authority of the church; Joan of Arc stated how. Eventually, the trial was continued behind closed doors. It appears Joan was threatened with torture, though there is no evidence she was actually tortured. As expected, Joan was found guilty and condemned to death by burning at the stake. Faced with such an overwhelming ordeal Joan broke down and confessed. However a week later she regained her strength and recanted her confession. This meant the penalty of execution by fire would be re-implemented. Witnesses recount she faced her ordeal with dignity. It is said that over 10,000 people came to see her execution by burning. Afterwards, her ashes were scattered in the Seine. One legend tells how her heart remained unaffected by the fire. 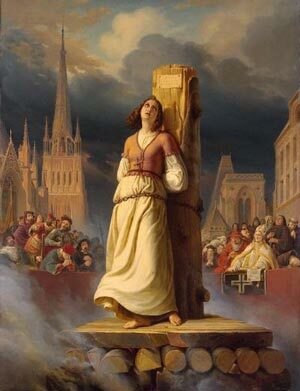 Twenty-six years later the English were finally driven from Rouen and in a later inquest she was declared to be officially innocent and was officially designated to be a martyr. She was canonised a saint in 1920 and remains the patron saint of France. Joan of Arc achieved a remarkable achievement in her short life of 19 years. In particular, she embodied religious devotion with great bravery and humility, her life helped change the course of French history. Citation: Pettinger, Tejvan. “Biography of Joan of Arc”, Oxford, UK. 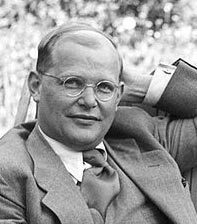 www.biographyonline.net, 21st Oct. 2013. Last updated 11th March 2017. Famous French People – A list of famous French men and women. Includes politicians, generals, artists, sportsmen and cultural figures, such as Napoleon, Marie Antionette, De Gaulle, Claude Monet, and Coco Chanel.